Download "Corporate Code of Conduct"
3 Advertising or promotional gifts of a nominal value; or Gifts given on festive or special occasions subject to a maximum limit. Any Advantage or gift accepted by a Relevant Person should be in accordance with Swire s procedures for Acceptance of Gifts or Advantages. Relevant Persons should decline an offer of a gift if acceptance of it could affect the Relevant Person s objectivity, or induce the Relevant Person to act against Swire s interests, or lead to questions of bias or impropriety. B. Offering Advantages Under no circumstances may a Relevant Person offer an Advantage to any person or company having business dealings with Swire for the purpose of influencing such person or company in any business dealings. Any Advantage given in the conduct of the Swire s business should be in accordance with Swire s procedures for Offer of Gifts or Advantages. Relevant Persons should exercise good judgment and practise moderation in giving gifts. These should not be given in cash, cash equivalents or loans. Excessive gifts in terms of value or frequency should not be offered to potential or existing customers. Gifts bearing a Swire logo are preferred. C. Observing local laws when working in another jurisdiction Sections A and B above apply whether the solicitation, acceptance and offering of Advantages are within or outside Hong Kong. 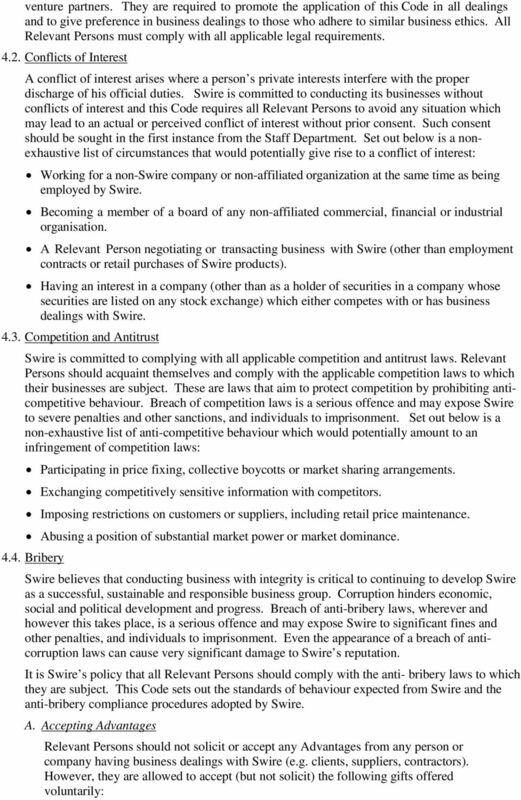 Any Relevant Person who conducts business on behalf of Swire in another jurisdiction must abide by the laws of that jurisdiction, including laws and regulations on anti-corruption, and all other laws and regulations pertaining to ethical business conduct. D. Payments to Government Officials It is strictly prohibited to offer an Advantage to any Government Official. Prohibited Advantages should not be made directly, through a Relevant Person s own personal involvement, or indirectly, for example by authorising or allowing a third party to provide a prohibited Advantage on behalf of Swire. Any request for an Advantage by any Government Official in relation to gaining business or a business advantage for Swire must be refused and promptly reported to an appropriate director or officer of Swire. 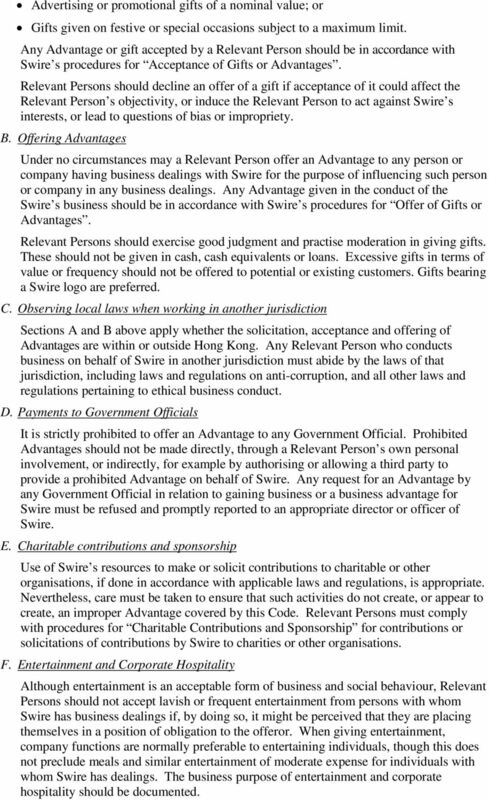 E. Charitable contributions and sponsorship Use of Swire s resources to make or solicit contributions to charitable or other organisations, if done in accordance with applicable laws and regulations, is appropriate. Nevertheless, care must be taken to ensure that such activities do not create, or appear to create, an improper Advantage covered by this Code. Relevant Persons must comply with procedures for Charitable Contributions and Sponsorship for contributions or solicitations of contributions by Swire to charities or other organisations. F. Entertainment and Corporate Hospitality Although entertainment is an acceptable form of business and social behaviour, Relevant Persons should not accept lavish or frequent entertainment from persons with whom Swire has business dealings if, by doing so, it might be perceived that they are placing themselves in a position of obligation to the offeror. When giving entertainment, company functions are normally preferable to entertaining individuals, though this does not preclude meals and similar entertainment of moderate expense for individuals with whom Swire has dealings. The business purpose of entertainment and corporate hospitality should be documented. 4 Relevant Persons should be particularly vigilant concerning entertainment offered to them outside Hong Kong and turn down invitations to meals or entertainment that are excessive in nature or frequency and appear to have no or minimal business purpose. It should be noted that any free trips or travelling expenses are considered as Advantages. 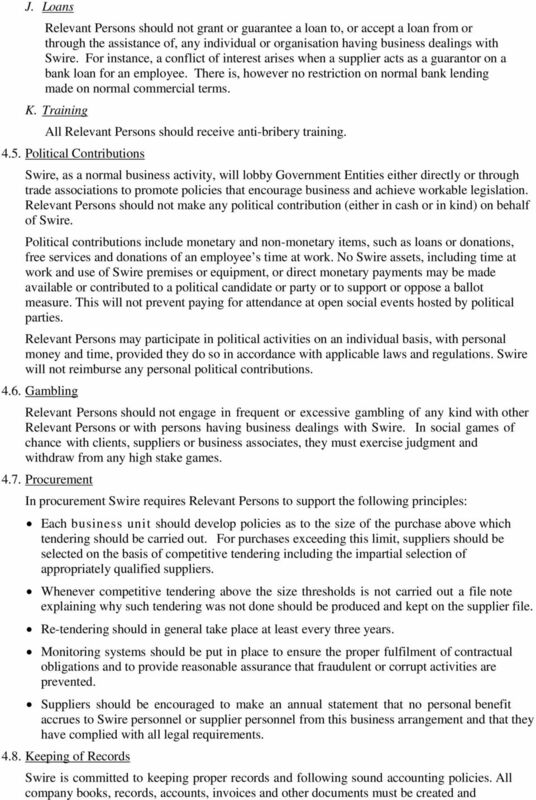 Without the prior consent of Swire, acceptance of these advantages is strictly prohibited. Relevant Persons should follow the procedures for Entertainment and Corporate Hospitality. G. Travel Expenses Travel expenses incurred on behalf of a person or company (including a Government Official or a Government Entity) that are directly related to promoting, demonstrating, explaining, or certifying Swire s products or services, or that are directly related to executing or performing a contract with Swire, may be proper. 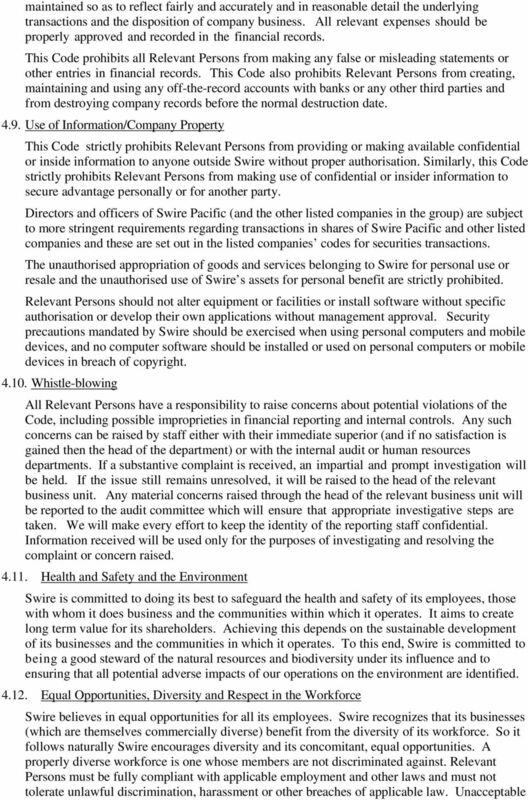 In practice, for purposes of promoting, demonstrating or explaining its services, Swire may occasionally invite a person or company (including a Government Official) to travel to its facilities, offices and exhibits for plant tours, product demonstrations or business meetings at Swire s expense. Swire may reimburse such persons or organisations for reasonable and bona fide expenditures directly related to any such purpose, such as travel or lodging expenses. Reimbursed travel expenses may include the reasonable cost of such person or organisation s transportation, meals, lodging and entertainment. 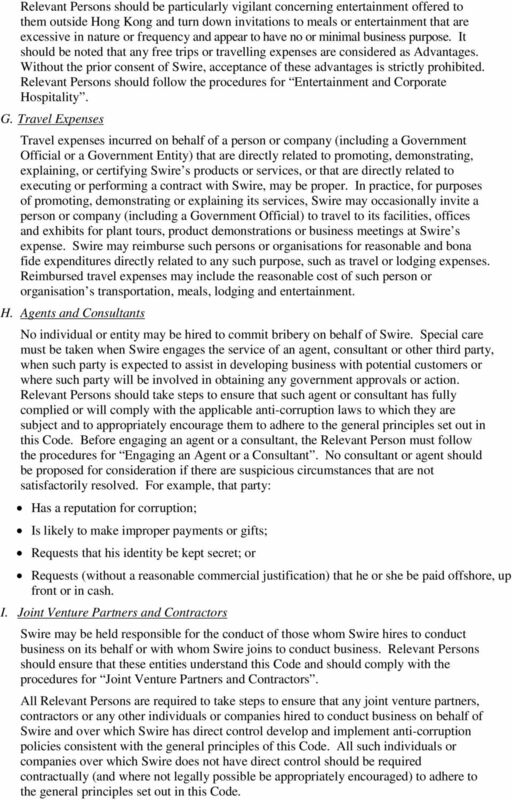 H. Agents and Consultants No individual or entity may be hired to commit bribery on behalf of Swire. Special care must be taken when Swire engages the service of an agent, consultant or other third party, when such party is expected to assist in developing business with potential customers or where such party will be involved in obtaining any government approvals or action. Relevant Persons should take steps to ensure that such agent or consultant has fully complied or will comply with the applicable anti-corruption laws to which they are subject and to appropriately encourage them to adhere to the general principles set out in this Code. Before engaging an agent or a consultant, the Relevant Person must follow the procedures for Engaging an Agent or a Consultant. No consultant or agent should be proposed for consideration if there are suspicious circumstances that are not satisfactorily resolved. For example, that party: Has a reputation for corruption; Is likely to make improper payments or gifts; Requests that his identity be kept secret; or Requests (without a reasonable commercial justification) that he or she be paid offshore, up front or in cash. I. Joint Venture Partners and Contractors Swire may be held responsible for the conduct of those whom Swire hires to conduct business on its behalf or with whom Swire joins to conduct business. Relevant Persons should ensure that these entities understand this Code and should comply with the procedures for Joint Venture Partners and Contractors. 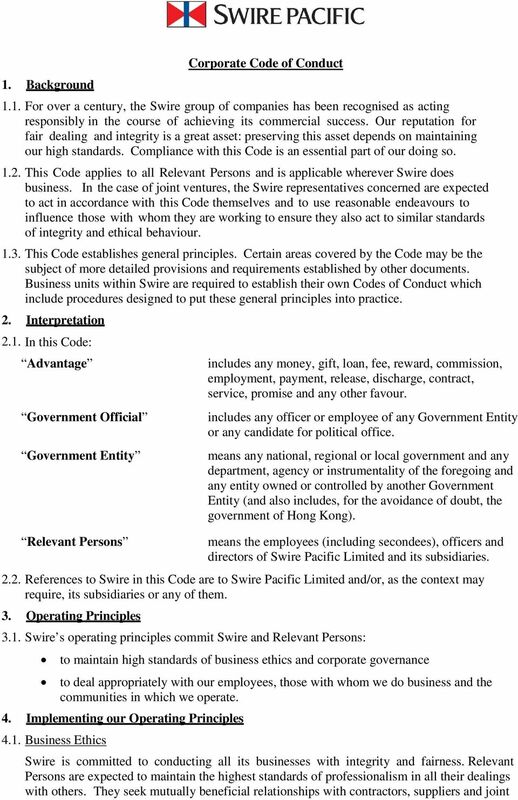 All Relevant Persons are required to take steps to ensure that any joint venture partners, contractors or any other individuals or companies hired to conduct business on behalf of Swire and over which Swire has direct control develop and implement anti-corruption policies consistent with the general principles of this Code. All such individuals or companies over which Swire does not have direct control should be required contractually (and where not legally possible be appropriately encouraged) to adhere to the general principles set out in this Code. 7 conduct must be reported to line managers or business unit heads. 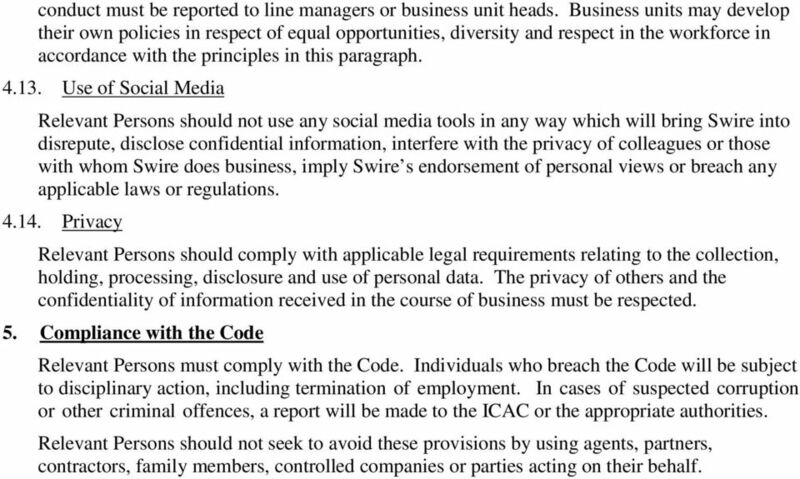 Business units may develop their own policies in respect of equal opportunities, diversity and respect in the workforce in accordance with the principles in this paragraph Use of Social Media Relevant Persons should not use any social media tools in any way which will bring Swire into disrepute, disclose confidential information, interfere with the privacy of colleagues or those with whom Swire does business, imply Swire s endorsement of personal views or breach any applicable laws or regulations Privacy Relevant Persons should comply with applicable legal requirements relating to the collection, holding, processing, disclosure and use of personal data. The privacy of others and the confidentiality of information received in the course of business must be respected. 5. Compliance with the Code Relevant Persons must comply with the Code. Individuals who breach the Code will be subject to disciplinary action, including termination of employment. In cases of suspected corruption or other criminal offences, a report will be made to the ICAC or the appropriate authorities. Relevant Persons should not seek to avoid these provisions by using agents, partners, contractors, family members, controlled companies or parties acting on their behalf. DRAFT Change History: Anti-Bribery and Anti-Corruption Policy Control Risks Group Ltd Commercial in confidence Introduction This document defines Control Risks policy on the avoidance of bribery and corruption. Consumers International Anti-Corruption and Bribery Policy Date of policy: October 2015 Policy approved by: Council Person responsible for policy: The Treasurer s Committee has overall responsibility.